For the last couple of years EditionGuard has relied on Adobe Digital Rights Management to protect our customers eBooks. Though Adobe’s solution is ideal for some of our customers, that was not the case for all. After countless discussions with our current customers, as well as non-customers, we decided to create a Social DRM solution to provide another option and more flexibility. We are happy to announce support for Social DRM for all EditionGuard users! This is a major step for our company and we look forward to hearing about how it helps your businesses moving forward. What Is EditionGuard Social DRM? EditionGuard Social DRM technology provides protection by embedding visible and/or invisible watermarks into the eBooks you sell. The visible watermark will display the personal information of the buyer, such as: name, email and phone number. You will have the option to embed this visible watermark at the beginning of your eBook, the end and/or randomly throughout the eBook. Implementing EditionGuard Social DRM requires very little setup time. You will no longer have to pay a download fee every time your eBooks are purchased. Removing Adobe DRM protection means your eBooks will now be compatible with all devices (seriously, every device). Your buyers can read your eBooks with the software of their choice. Your buyers will be able to download and begin reading their eBook instantaneously. EditionGuard Social DRM and Adobe DRM are very different, so we recognized the need to create new pricing plans tailored towards our users who plan to use EditionGuard Social DRM only. After speaking with many of our amazing customers, as well as people that showed interest in our Social DRM offering, we decided to create two new plans. The two new plans will be called Nano and Micro and will consist of EditionGuard Social DRM only protection and will be supported by our turnkey integrations. Though all other plans will have the option to use Social DRM, these dedicated plans will not have the option for Adobe DRM protection. Remember the download fees you used to have to pay for Adobe DRM protection? Those are a thing of the past with our Social DRM offering! That means no matter how much you sell, your monthly price stays fixed. 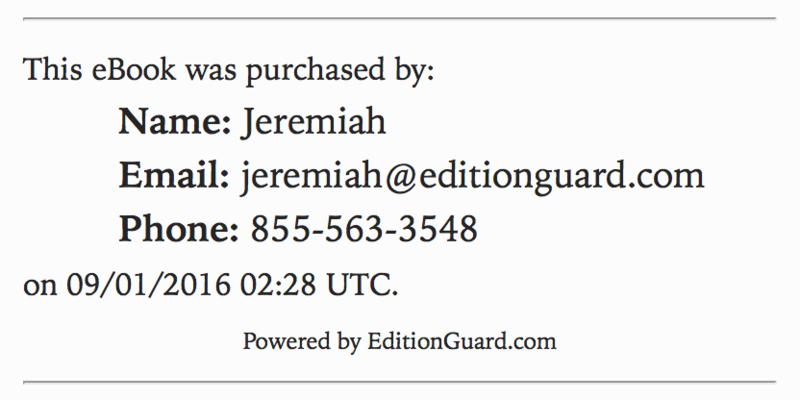 If you are a current user, all you will have to do is change your protection settings within the EditionGuard tool. Since your customers have to include personal information to download your eBooks, there is no work required on your end at all. 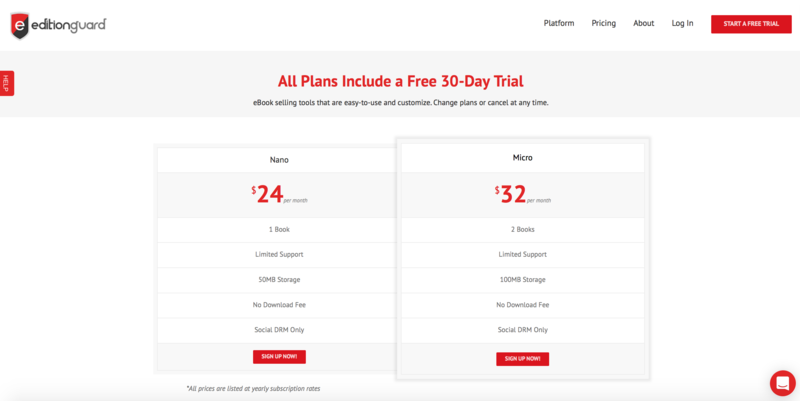 For new EditionGuard users, you can start a 30-day free trial and decide which of our five pricing plans is the best fit for you. If you have any questions, you can contact us by clicking on the red chat widget in the bottom right corner of our website.